Einstein’s law of special relativity provides us with a model for how particles will act when moving at close to the speed of light. Recently there has been great advancement in the production of superheavy elements. For these elements with an atomic number greater than 104 life is short lived. The instability of the nuclei, created through fusion is such that the superheavy elements decay within seconds of creation. However this hasn’t stopped researchers from combining these with other nuclei through covalent bonds to produce superheavy compounds. These superheavy nuclei have such an large number of protons that they actually act to accelerate the “orbiting” electrons to ~80% the speed of light. At this speed you would begin to expect the law of special relativity to raise it’s head and cause strange results in the properties of the structure. Until recently the covalently bonded compound didn’t offer anything out of the usual when examined. Most likely due to the type of bonding, which is a sharing of the outer free electrons between the neighbouring nuclei. This sharing means none of the electrons are free to undergo this accelerating process. However Christoph Düllmann at the GSI Helmholtz Centre for Heavy Ion Research in Darmstadt, Germany and his colleagues have combined seaborgium and six carbon monoxide molecules. The seaborgium element is the 106th in the periodic table and as the researchers have done this using a metal-carbon bonds will leave some outer electrons free. This compound only lasted 10 seconds but in that time both the volatility and reactivity. When compared to the theoretical predictions it was found that these had a discrepancy that only evoking special relativity could rectify. This once again displays the power of the theories that Einstein laid down over 100 years ago and how they can still be used to explain discrepancies between fundamental physics in systems when the velocities become comparable to the speed of light. 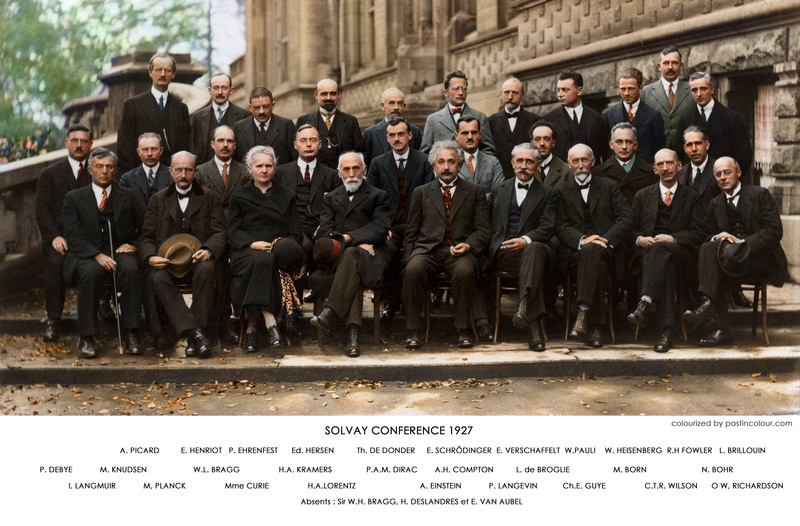 Many of my readers may remember that last year I wrote an article about a remastered picture of the Solvay Conference of 1927. This picture had been re-coloured and gave a whole new depths to the eminent scientists who we are standing on the shoulders of today. 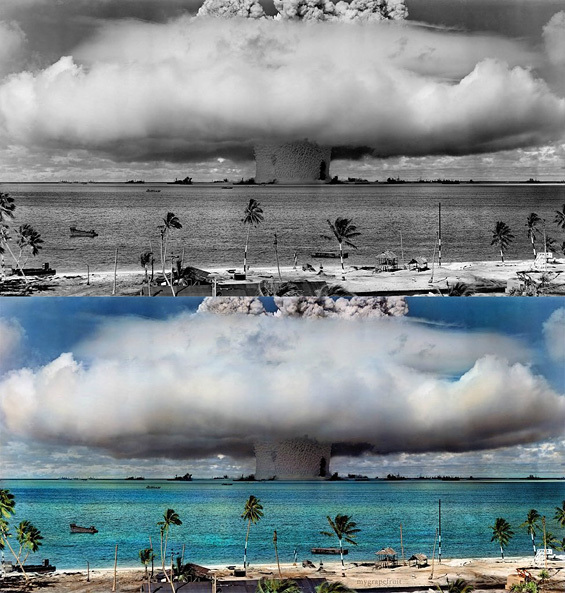 Well I was browsing the internet this evening when I found a user of Deviant art called Mygrapefruit who has been rejuvenating many more famous pictures from the past. Their gallery is a masterpiece and is a definitely worth a view, but I thought I would share a few of my favourite science related ones. Albert Einstein (1879-1955) – Famous for the Special and General Theories of Relativity and also a 1921 Nobel prize winner for discovering the photoelectric effect. In 1869, Dmitri Mendeleev published a paper which included a table of all the known elements in existence showing trends in electron configuration and properties. Since then a large portion of nuclear physicists have been trying to use various techniques in order to push the boundaries of this table. As of May last year with the production of Livermorium (atomic number 116) there exists 118 elements in the periodic table, but only 114 have ever been experimentally confirmed and recognised by the International Union of Pure and Applied Chemistry (IUPAC). Four elements exist as theoretical models with a small amount of evidence due to the inconclusive amounts of these produced. As such they adopt a nomenclature which reflects their corresponding atomic number. 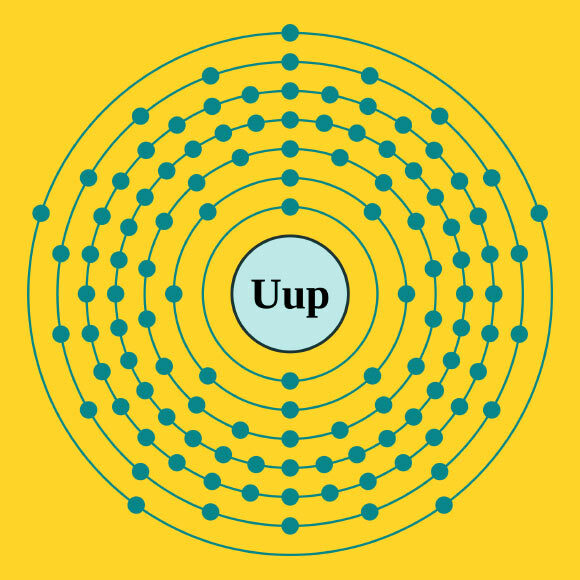 These include Ununtritium (Z=113), Ununpentium (Z=115), Ununseptium (Z=117) and Ununpentium (Z=118). However Professor Dirk Rudolph of Lund University in Sweden believes he has amassed enough evidence to confirm the existence of Ununpentium. This follows after claims that back in 2004 a team of Russian and American scientists had created the substance but the evidence was deemed insufficient. In order to produce this element involved bombarding a film of americium with calcium ions with the resulting ununpentium atom existing for a fraction of a second before decaying to stable lighter elements. The longest measured half-life of this fascinating element is only approximately 200ms. Four isotopes are believed to exist with 172, 173, 174 and 175 neutrons in their nucleus respectively. If approved a likely name to be given to this element would follow that of its discoverer Sergie Dmitriev. Due to the rapid decay time the uses of this super heavy element and those of similar “weight” are very limited and may only ever be useful for research purposes. Everyday these nuclear physicists are pushing the boundaries of the heaviest element in the periodic table with the sights set of pushing this far beyond ununoctium (Z=118). There is even a theory called the island of stability which states that at slightly higher atomic numbers there may exist super heavy elements which actually have rather substantial half lifes. These could be minutes to days with some optimists even suggesting millions of years. This theory is not unfounded though, complete quantum shells produce “magic numbers” in the quantity of protons of neutrons in the nucleus which has a spike of stability. A element of particular interest is Unbihexium-310 which would contain 126 protons and 184 neutrons which makes it “doubly magic” and the most likely candidate for much greater stability. Released today in the US by the National Museum of Health and Medicine in Chicago, is an iPad app which lets you see into the mind of Nobel prize winner and world renowned genius Albert Einstein. After his death in 1955 the centre took almost 350 close up images from slide of Einstein’s brain. A study conducted in 1999 showed that the area of this great physicists brain responsible for mathematical thinking and spatial awareness was found to be 15% bigger than that of an average person. In 2007 the University of Nottingham started an site which let the public categorise it’s database of 250,000 galaxies called Galaxy Zoo – http://www.galaxyzoo.org/ . In the 5 years since then many galaxies have been categorised and out of those galaxies the researchers have picked galaxies that appear like the letters of the alphabet. In October 1927 the best minds in physics at the time met to discuss the new development that was Quantum Mechanics. 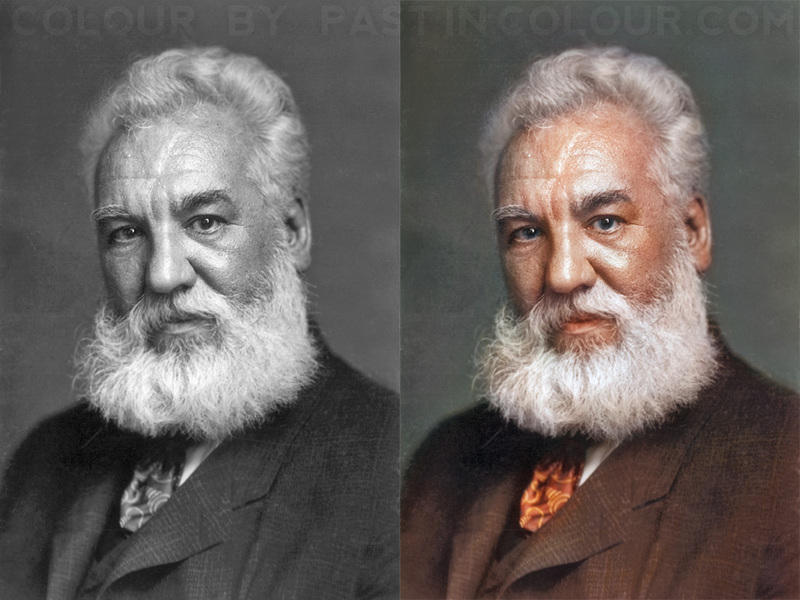 The iconic picture of these great scientists taken during the conference has recently been remastered using new Photoshop software into original colours. This breathtaking new spin on the picture gives us a feel of early 20th centruy physics in a completely new way. Even though Einstein’s discovery of the photoelectric effect showed that light had a duality between waves and particles and went on to win him the Nobel prize he was never convinced of the idea behind Quantum Mechanics. He believed as many classical physicists did that if nature could only be predicted and not known in definite then the whole concept of physical law breaks down.